As part of a series of exhibitions exploring personal utopias Göllner constructed a small one-person dwelling based on the design standards of late modern institutional architecture in Canada. The cube-shaped hut was built from coreboard plastic sheeting and designed for mass production and easy assembly. Conflating the egalitarian design strategies from large public buildings of the 1960s into a personal, disposable refuge of today provided a witty and resonant commentary on contemporary society. Artist Adrian Gollner is flying all the way from his home in Canada to construct a small one person dwelling in the Archer’s Field of Chrsitchurch’s Botanic Gardens. Titled U Build, his project explores utopian architectural grand schemes and design principles of late modern institutional architecture in Canada; ideas that are applicable to most of the western world that has survived many an idealistic government housing plan. Referencing these ‘knock-em up quick’ buildings, and with a nod to the impracticality of such government edifices for the masses, U Build is constructed from cheap coloured coreboard. 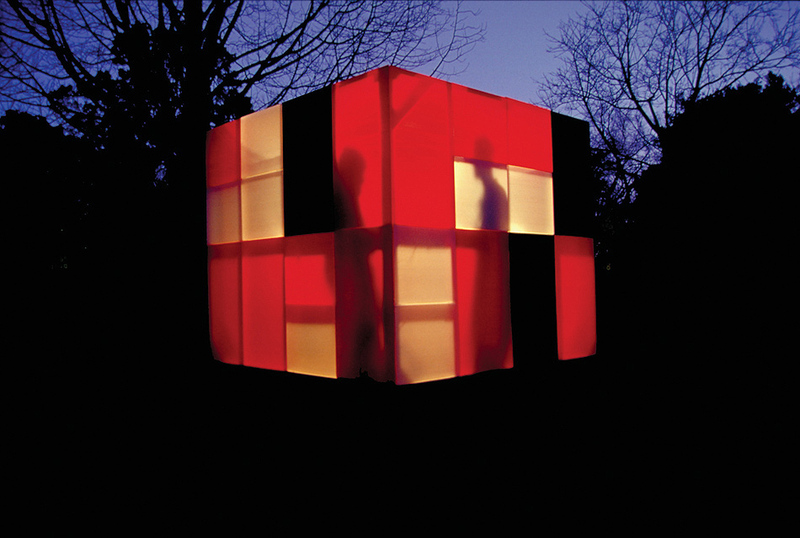 For the night wanderers amongst you, it is illuminated from dusk to resemble a glowing coloured box. Gollner’s installation is scheduled to coincide with the High Street Project’s current show ‘Fly Through’ which exhibits the work of Ri Williamson and Thom Craig. ‘Fly Through’ is a manifestation of ongoing dialogue and drawing between these two artists, who, like Gollner share an interest in the politicisation of space, primarily in the instance of ‘ready-made’ housing and seemingly endless subdivisions. The latest kid on the block being the ‘gated communities’ where every probable and barely imaginable form of social neuroses appear to be incubating and festering. (Save pukeko from subdivisions). U Build opens on Friday 3 September at the Archer’s Field, Botanic Gardens (just past the wee hill by pond) at 5.30pm and both shows run until 18 September. I have arrived at architecture through art. Public art commissions and an interest in modernism have led me to consider architecture as a signifier of the moods, aspirations and aesthetics of a society at a particular point in time. In the fall of 2003, I mounted an exhibition entitled Modern U. at Carleton University in Ottawa, Canada, which addressed the utopian ideals inherent in the late modern architecture of the campus. I have taken the architectural design principles of the larger institutional buildings and conflated them into the design of a single-person dwelling. My intention was to demonstrate how the collective utopian ideals of the earlier generation might now only be pursued on an individual basis. In the year following the acceptance of the U-Build project as part of the High Street Project’s series of exhibitions exploring utopias, I became aware of a general and growing interest in late modern architecture and, in particular, kit-houses. I read articles in airplane magazines, home design magazines and in architectural journals, all of which look back at experiments with kit-houses in the 1960s in the wake of a current architectural designs for the same. My project might only differ from the trend in that an element of satire was introduced through the use of particularly cheap materials. Indeed, the practical concerns of designing and building my own kit-house made my pursuit very close to that of an architect’s, especially when one considers that we both apply principles of design developed under modernity: modularity and space and cost efficiency. The walls and ceiling of the U-Build hut were made from coreboard corrugated plastic sheeting, a product most commonly used as a backing for temporary exterior signs. Light, colourful and inexpensive, it seemed like the perfect derivative of our disposable societies with which to build the dwelling. That said coreboard proved to have some admirable qualities. Waterproof, durable and capable of being folded into some remarkably hard-wearing forms, coreboard was used to create building units that provide both surface and structure to the hut. 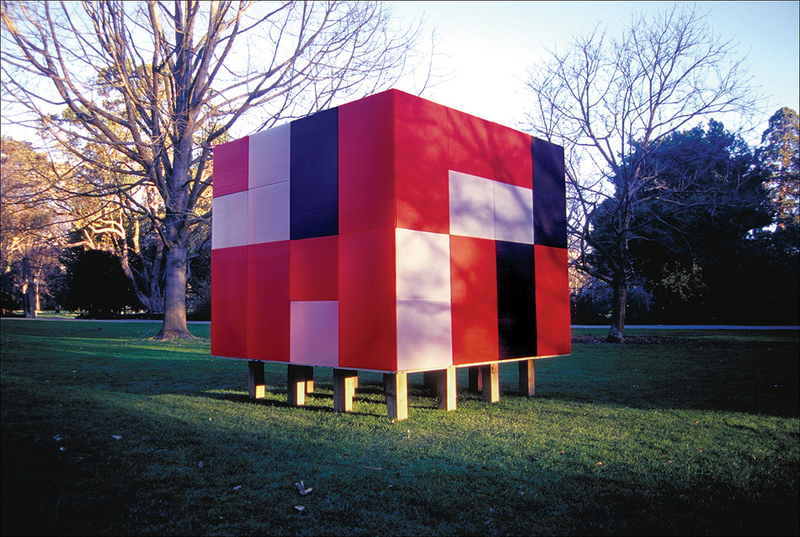 The completed dwelling was a three-colour plastic cube measuring 2.4 x 2.4 x 2.4m and suitable for occupancy by one highly idealistic individual. U-Build has its origins in 2003’s Modern U, a project in which Adrian Göllner addressed the architectural style of the Carleton University in Ottawa. Built between 1952-72 Carleton University was shaped by a modern aesthetic that designed an infrastructure that sought to control and influence the inhabitants and users of the campus. Hence Modern U is half satire, half sincerity. The very title mimics a kind of sartorial TV show, or handbook, which directs one across the heady waters of provincial parochialism into a furtive and surface orientated (read consumptive) ‘modern you’ of post-war, egalitarian optimism. However, Göllner ‘s satire (if indeed it is that) never reads so simply. The tone is, in some manner, extremely earnest. What one commentator writes off as the architectural experience of a bland ‘fast food restaurant’ Göllner celebrates as a grandiose architectural conception which deigned to build ‘outside of the sullied urban core, [so that] the young minds could be formed in an idyllic atmosphere of trees and dynamic new architecture’. Göllner’s banner works for Modern U mimed the original architectural promise, bringing back the arcane knowledge that formed its conception and structure. For instance, the poster which accompanied the Lanark dormitory was accompanied with the snappy slogan, “Up all night philosophising” which is riducoulsy funny, but just the kind of notion and enthusiasm, a post-war, egalitarian sensibility would think. Göllner’s banner plays off that initial planning, showing the way the dormitories were structured to organise, or at the very least encourage communion. These smaller satellite congregations would then feed into larger networks in an ongoing circuit of enthusiasm and shared experience. The very stylisation of Göllner’s graphic mimes the plugs of electrical circuitry, a much more obedient and subservient system – which is precisely why so much trouble goes into inducing the environment at Carleton University. Such is habitation control – you should see what biologists need to do to test fertility-breeding programs. Which I suppose is what one could think of the whole Carleton University – Modern U experiment in which the next generations minds are to be shaped and nurtured for the future. I suspect that the U-Build house will have an equivocal presence. This neat plastic form set amongst trees would be the very essence of the modern dwelling. At the same time, the house might seem like a rather sad and naïve attempt to rekindle the collective societal aspirations of an earlier generation, albeit on an individual basis. I am also aware that this modular building kit may recall some Bauhaus projects of the 1930s. Gerrit Rietveld’s depression era Crate Chair, for example, was very much a people’s project. In fact, that the house will be made from sections of brightly coloured Coroplast, it may well resemble one of his primary coloured DeStijl buildings. So in some ways, Göllner’s U-Build seems quintessentially caught up in that modernist drive towards a Utopian simplicity as a refined dwelling, pleasantly set amongst the trees, not to mention its ready-to-assemble egalitarian mobility. But for all this, there is something about its pragmatism and announcement as retreat that I can’t help but want to compare to Henry Thoreau’s little hut in Walden. The most interesting dwellings in this country, as the painter knows, are the most unpretending, humble log huts and cottages of the poor commonly; it is the life of the inhabitants whose shells they are, and not any peculiarity in their surfaces merely, which makes them picturesque; and equally interesting will be the citizen’s suburban box, when his life shall be as simple and as agreeable to the imagination, and there is as little straining after effect in the style of his dwelling (47). It is with this in mind that he warns us, ‘if one designs to construct a dwelling house, it behooves him to exercise a little Yankee shrewdness, lest after all he find himself in a workhouse, a labyrinth without a clew, a museum, an almshouse, a prison, or a splendid mausoleum instead’ (28). Yankee shrewdness indeed. What Thoreau really means is a certain sort of dogmatism, a willingness to follow his self-actualised, Spartan simplicity. His argument then, centres around a kind of diatribe which valorises the poetic sentiment of freedom over a misanthropic resentment at society’s economic infrastructures: There is some of the same fitness in a man’s building his own house that there is in a bird’s building its own nest. Who knows but if men constructed their dwellings with their own hands, and provided food for themselves and families simple and honestly enough, the poetic faculty would be universally developed, as birds universally sing when they are so engaged. But alas! we do like cowbirds and cuckoos, which lay their eggs in nests which other birds have built, and cheer no traveller with their chattering and unmusical notes (46). It would seem then that U-build seems peculiarly prone to a belaboured occupation as though it was a re-enactment of Thoreau’s hut. Built from such self-sufficient and Spartan material as coroplast, U-build is exactly that less ‘luxurious box’ Thoreau so eagerly wanted society to adopt. That it is so thoroughly convincing in its ornamental colouring and surface slickness as a quintessentially contemporary building seems to mark out U-build as a troubling decoy that enlists that modern palette of refinement and ornamentation back into that peculiar quotient of form, functionalism and nature. It is this that so complicates the very notion of actually inhabiting, or deploying U-build, as either aesthetic object, or as mobile, self-sufficient residence. Ultimately it comes down to a certain willingness, an engaged enthusiasm, that will need to go back to that aesthetic-ascetic/endurance-enjoyment kinda scale if they’re ever to make up their mind. Paul Gessell, The Ottawa Citizen, Thursday, October 2, 2003; E4. Henry, Thoreau, Walden, Princeton University Press, 1989; 22. All other references in text.